Workshop and Performance in Osaka, Japan. Transnational Art 2010 is a contemporary art exhibition gathering 38 talented artists from around Japan and around the world at the Osaka Contemporary Art Centre. The show is curated by Celio Barreto and Yachiyo Nakao, owners of SoHo Art Gallery and features works in a wide array of media, from oil paintings to video installations and performance art. Included in the program are an Opening Performance by renown artist Kotaro Hatch on the first day, and an artist talk on Saturday Jan 30th, featuring presentations by participating artists and very special guests from the Flanders Center and Osaka Arts Planning. TA2010 showcases artists whose movement between geographical and cultural points influence their work to function as both windows and mirrors, allowing us to see into their worlds and reflecting the world around them. 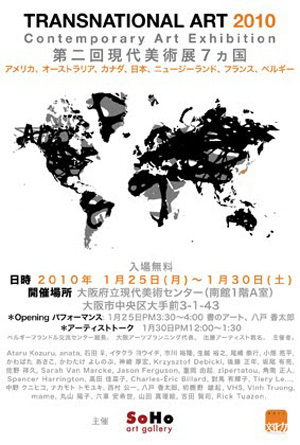 We are happy to announce the upcoming contemporary art group exhibition organized by SoHo Art Gallery of Osaka to take place at the Osaka Contemporary Art Centre's Exhibition Room A, from January 25th to January 30th, 2010. This special exhibition features new graphic, painting, sculpture, installation, multimedia and performance art works by 38 emerging and established artists from Australia, Belgium, Canada, France, Japan, New Zealand and The U.S., who're often living and working between their home countries and Osaka. The goal of this exhibition is to present the public with a comprehensive collection of unique new works addressing issues in contemporary art by artists working or living in a transnational context. anata, Seishi ISHIDA, Youichi ITAKURA, Hirotaka ICHIKAWA, Ryohei OBATA, Takayuki OSHIMA, Hiroyuki OGOSHI, Tiery Le... (France), Yoshinobu KAWATAKE, Akiko KAWABATA, Atsuhiro KANZAKI, Ataru KOZORU, Masatoshi GOTO, Yusuke SAKAO, Yoshihisa SANO, Yuki SHIGEOKA, Masato SUNAMI, zipertatou (Canada), Kanako TAKADA, Sanae TAMURA, Rick TUAZON (U.S.A.), Yukiko TSUSHIMA, Vinh TRUONG (Canada), Krzysztof DEBICKI (Canada), Kunihiko NAKANO, Tomoyuki NAKAMOTO, Kouichi NISHIMURA, Kotaro HACHINOHE, Yuuki HATSUKANO, Charles-Éric BILLARD (Canada), VHS, Jason FERGUSON (Australia), Sarah VAN MARCKE (Belgium), Yoko MARUYAMA, Akiyo MUGURUMA, Marie YAMADA, Kenji YOSHIDA and RANDOM (New Zealand). Contemporary Art on display: Paintings (Oils, acrylics, mixed media), Drawings (Color pencils, pen and ink), Installation, Prints (silkscreen), Performance (Live Painting), Interactive Video Installations, Video Projections, Sculpture (Stone, glass, resin and ceramics) and 2D and 3D Photography. Monday January 25th from 3:30 p.m. to 4:00 p.m., in gallery A.
Monday Jan. 25th: 12:00 p.m. to 6:00 p.m.
Tuesday January 26th to Friday Jan. 29th: 10:00 a.m.-6:00 p.m.
Saturday Jan. 30th: 10:00 a.m.-3:00 p.m.
- Tanimachi Subway Line: Get off at Tanimachi 4-chome Station, and take exit No. 1-A. The centre is a 3 minute walk away. - Keihan Temmabashi Station: Take the East Exit ad walk 10 minutes southbound. Supported by: Flanders Center, Osaka Arts Planning, Holbein Art Materials Inc. Under the auspices of: Osaka Contemporary Art Center and the Kansai Agency for Cultural Affairs 'Power of Culture' iniciative.